Everyone loves a little bit of pizzazz on special occasions, and these swing cards are just the thing to spice up your gift-giving. They are relatively easy to make and amazingly versatile when it comes to sizes and shapes.... you can even buy dies that will cut your entire swing card, fancy shapes and all! 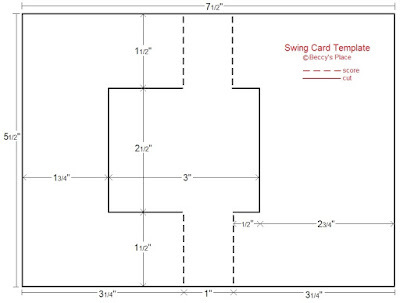 Today, though, I'm just going to show you how to do-it-yourself with a basic rectangular swing panel on a square shaped card. 1. 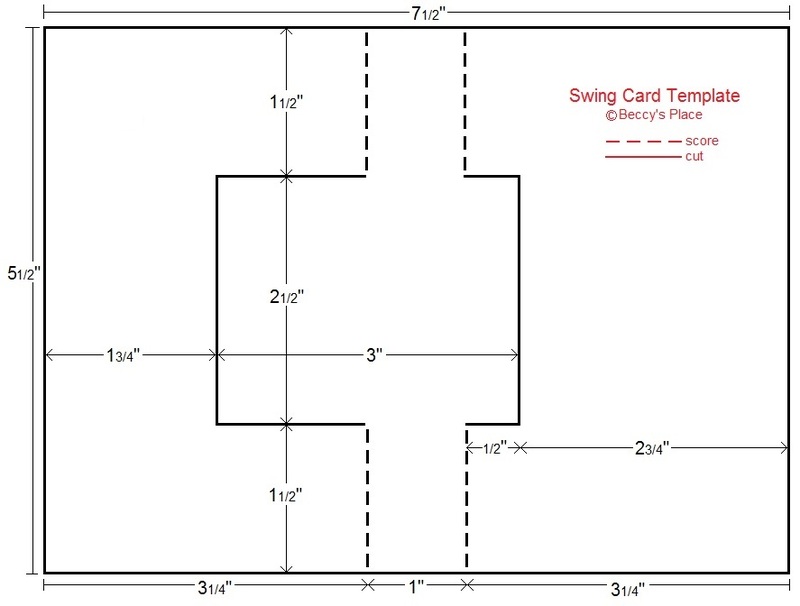 Start with a piece of cardstock measuring 51/2" x 71/2". Place the cardstock horizontally on your score board. You will be making four individual score lines - two at the top that are 1" apart, and two at the bottom that are also 1" apart. Each score line needs to be 11/2" long. As you can see in the photo below, I use a ruler as a guide so I know where to stop the score line. Start by scoring your first line at 31/4". It should only be 11/2" long measuring from the top of the cardstock. Now make another line in the same way at 41/4". 3. To make the bottom two score lines you will need to do the same thing, but measure 11/2" up from the bottom of the cardstock. Make your third score line at 31/4", and your fourth score line at 41/4". Refer to the template above. 4. Use a craft knife or trimmer to cut the swing panel. (Refer to the template for placement and length of cuts.) The first vertical cut is 21/2" long and starts 13/4" from the left hand side of the card and 11/2" from the top. The second vertical cut is 21/2" long and starts 43/4" from the left hand side of the card and 11/2" from the top. Now you need to cut horizontally from the top of the first vertical cut to the top of the second vertical cut WITHOUT cutting between the score lines. Do the same for the bottom section remembering not to cut between the score lines. Your card should now look like the photo below. 5. Fold and crease along the score lines. The card base is now complete and the centre panel should swing as it is opened and closed. 6. To decorate, cut some patterned papers for the inside of the card, removing the sections around the flip panel. You'll also need two panels for the swinging section of the card... one for the front and one for inside. 7. Stamp and colour the two image panels as desired. 8. Now adhere all the papers and panels in place. Remember to fully OPEN the card to place the inside panel. 9. Close the card and adhere the front panel in place. 10. Add any additional embellishments as desired. So cute and funny too, great card! Great card. Thank you for the instructions. A great card and thanks for the tutorial. Thanks for the tutorial Beccy - these are so much fun and I always have to think hard before I make them - this should east the stress. This is great thanks for the tutorial - I love the image!! Hoi Beccy, it's a beauty. Thanks for your tutorial. I deffenely go to make this one!! I want to do this one! Thank you. FAbulous card ! Thank you for the tutorial ! Thank you for the easy tutorial. Adorable card, love the colouring of this image. 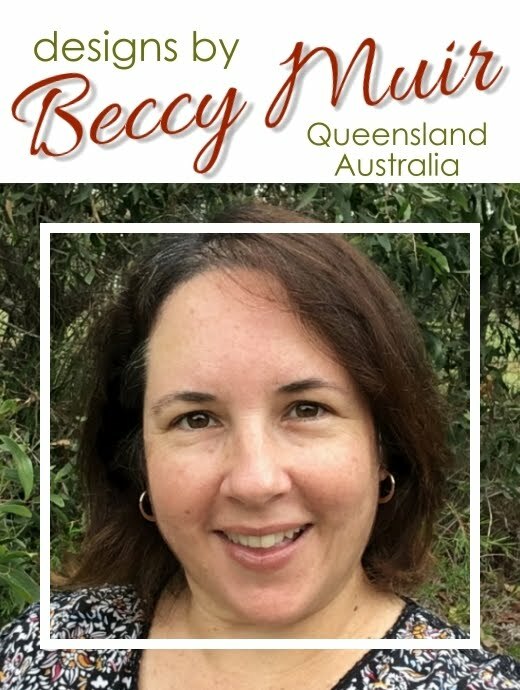 Thanks for the great tutorial Beccy! I've been wanting to give swing cards a try! Great card! Thanks for the tutorial! Going to try this cute card. It certainly has a special effect!